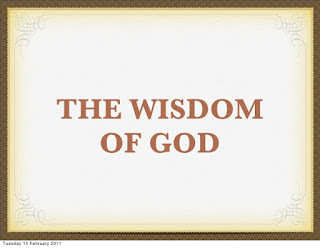 We need God’s wisdom to see from His point of view, not from a human viewpoint. God’s wisdom is way beyond our level of understanding. It is one aspect of the essence of our holy God and Creator. His ways are not the same as our ways. His thoughts are far above our thoughts (Isaiah 55:8 & 9). If we diligently seek wisdom we will be empowered to walk in righteousness regardless of negative circumstances around us. ‘My son, if you will receive my (wisdom’s) words and store up my commandments within you, turn your ear to wisdom and apply your heart to understanding, yes if you call out for discernment and lift up your voice for understanding, if you seek her (wisdom) as silver and search for her as for hidden treasures, then you will understand the fear of the Lord and find the knowledge of God.